Μετά το E-Up! Concept που είδαμε στην έκθεση της Φρανκφούρτης το 2009 και το e-Co-Motion Concept που είδαμε στην Γενεύη φέτος, η Volkswagen μας παρουσίασε στη φετινή έκθεση της Φρανκφούρτης το e-load Up! Concept. Στην ουσία είναι η βαν εκδοχή του e-Up! και σύμφωνα με την εταιρία είναι το “ευέλικτο όχημα παραδόσεων πόλης” που θα το βρουν ιδιαίτερα χρήσιμο deliverάδες και τεχνικοί. Κατά συνέπεια, έχει στοιχεία φιλικά για τέτοιου είδους επαγγέλματα όπως τα πλαστικά panels, τα μπλοκαρισμένα πίσω παράθυρα και μία ανακλινώμενη θέση συνοδηγού που επιτρέπει στο μικροσκοπικό Up! να αυξάνει τη χωρητικότητα του χώρου αποσκευών στα 1.400 λίτρα! Ζυγίζει 1.164 κιλά και την κίνηση έχει αναλάβει ένα ηλεκτρικό μοτέρ απόδοσης 60 kW (82 αλόγων) και 210 Nm ροπής που συνδυάζεται με μία μπαταρία ιόντων λιθίου τα ων 18,7 kWh. Ο συνδυασμός αυτός, επιτρέπει στο e-load Up! να φτάσει τα 100 χλμ/ώρα από στάση σε 12,4 δευτερόλεπτα και να συνεχίσει να επιταχύνει μέχρι τα 130 χλμ/ώρα της τελικής του. 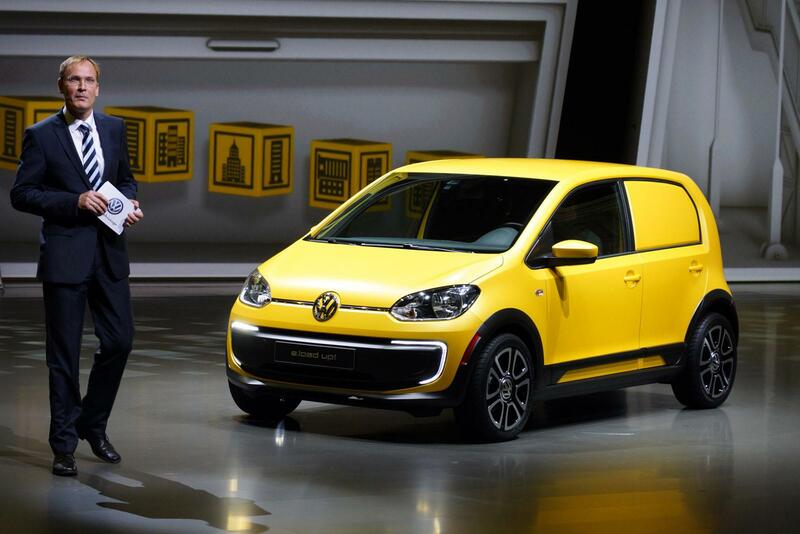 IAA 2013: Volkswagen Commercial Vehicles presents the new e-load up! Hannover/Frankfurt, 09. 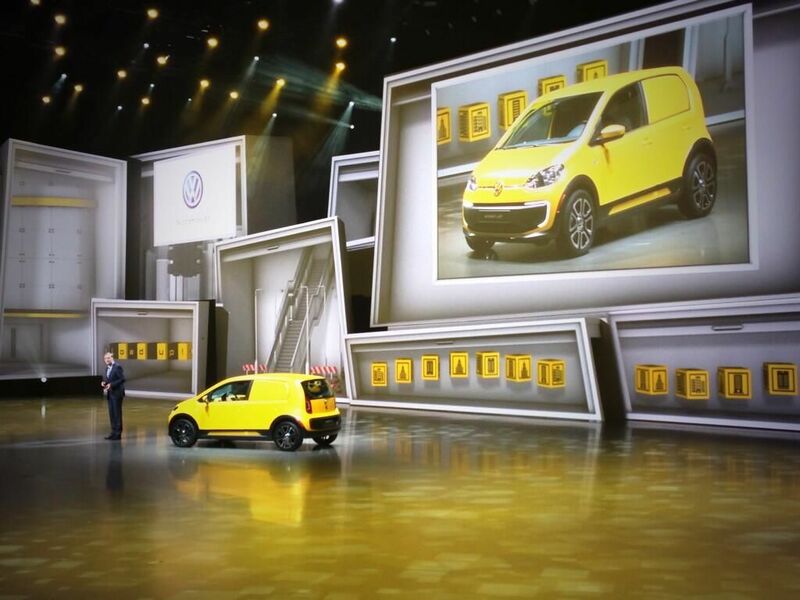 September 2013 – At this year’s International Motor Show in Frankfurt Volkswagen Commercial Vehicles is presenting a further idea on the theme of ‘urban commercial mobility’: an electrically powered city delivery van called the ‘e-load up!’. 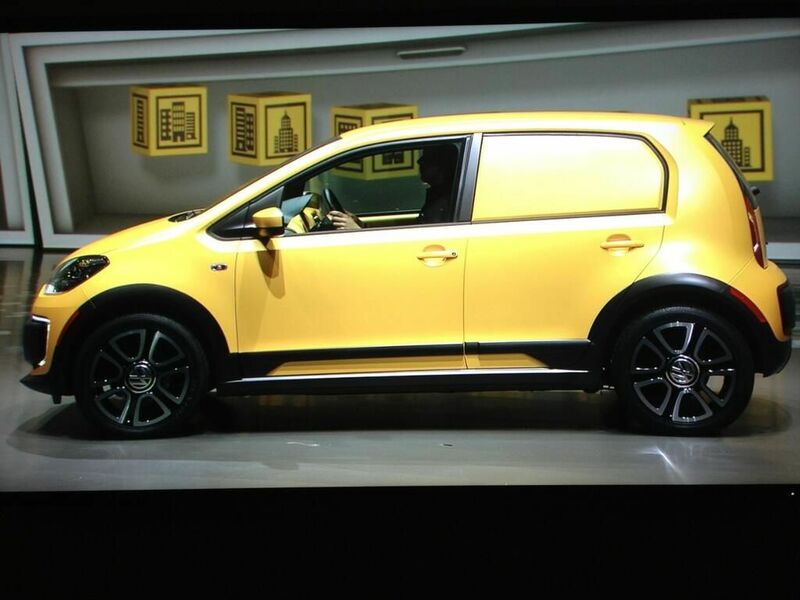 It has four doors, four wheels and despite very small outer dimensions a whole host of space inside. A cargo management system enables the interior to be configured in many ways. After all, how big does a van need to be? The answer, of course, is the right size for the job in hand. Too big is inefficient, and so is too small. In the case of an agile city delivery vehicle, which is just as suitable for service technicians as it is for couriers, pizza deliveries or social services, 3.54 metres is fine. The result is called the load up! – an economical, highly flexible little vehicle with a seat for the driver, a fold-up passenger seat and over 1 m3 of space in the back. The concept. The idea behind the load up! is that a very small van that carries correspondingly small loads is able to operate more efficiently than a larger vehicle if, when larger volumes need transporting, the operator can rely on a fleet of sister vehicles. The key idea here is collective intelligence. The advantages are obvious: small, agile vehicles are ideal for large, congested cities. For reasons of efficiency conventional delivery vehicles are not dispatched from the logistics centre until they are full to capacity. This means that the first 10 parcels have to wait for the next 100 before they can be delivered. That’s not the case with the e-load up!. Its electric motor also makes driving in zero-emission zones possible. The e-load up! is small, inexpensive to maintain, flexible and environmentally friendly. It is a light commercial vehicle in the best sense of the term. 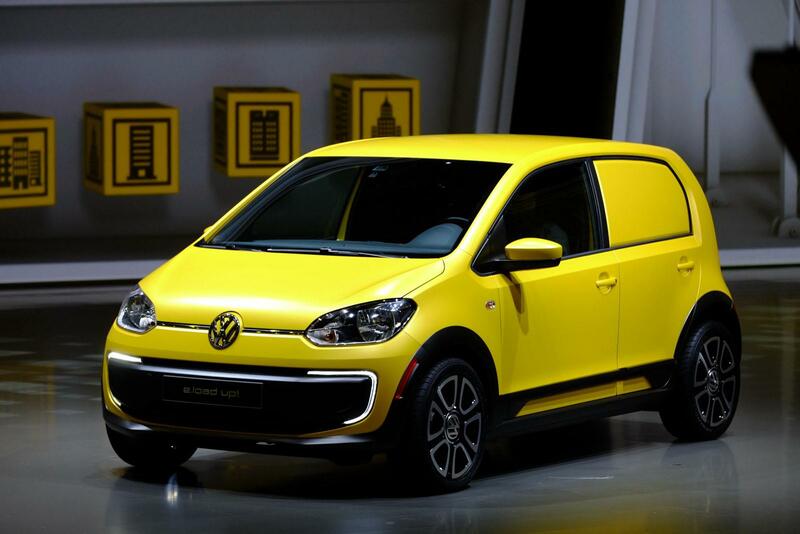 It is based on the passenger car version of the Volkswagen e-up!, which is available to order now in certain markets. Given the right level of demand, a commercial vehicle version, such as the e-load up!, could thus also be available soon. The background. 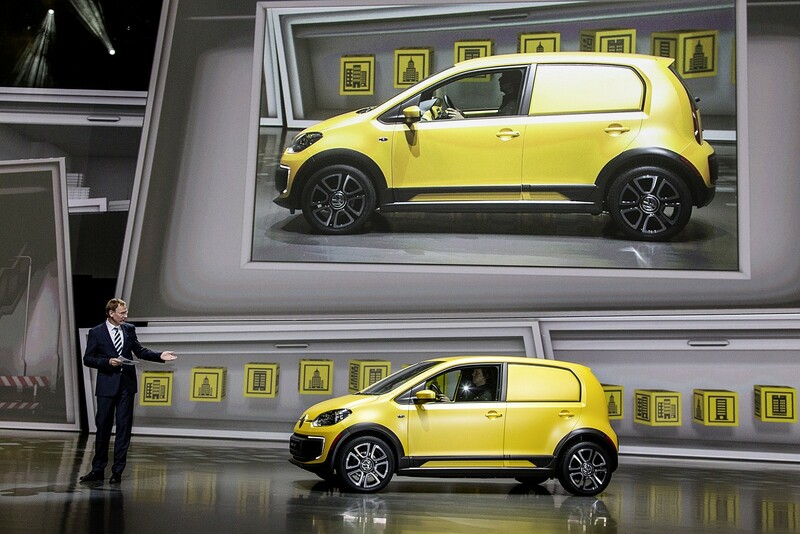 Volkswagen Commercial Vehicles presented an electrically powered concept vehicle six months ago at the Geneva Motor Show: the Volkswagen e-Co-Motion. The Hanover-based specialists for light commercial vehicles are confident that commercial customers in particular, as a result of their existing service infrastructures, have a good basis for the efficient utilisation of battery electric vans. However, with a length of 4.55 m the e-Co-Motion is in a different league to the e-load up! : an electrically powered vehicle of its class would, however, perfectly fill the gap in urban delivery services between the load up! and large trucks. The facts and figures. Compared to the passenger model the cargo capacity of the load up! has gone up from 951 to over 1,400 litres. This urban delivery van weighs 1.164 kg and can carry a total load of 306 kg – which certainly ought to be enough for any pizzas or parcels! It is powered by an almost silent electric motor with maximum power output of 60 kW / 82 PS. Continual output is 40 kW / 55 PS. Its maximum torque of 210 newton metres is available from the very first revolution. It thus accelerates from 0 to 100 km/h within 12.4 seconds and reaches a top speed of 130 km/h. The lithium-ion battery integrated into the floor has a storage capacity of 18.7 kWh. Thanks to the low vehicle weight, the e-load up! can travel up to 160 kilometres (NEFC) on a single charge. As in the e-up! model, the interface for charging the battery in the e-load up! is concealed under the ‘fuel cap’. Available as an option is the CCS combined charging system standardised by Volkswagen and other manufacturers. It supports both direct and alternating current charging, so that the vehicle can be charged at the majority of charging stations, regardless of electricity source or charging speed on offer. In this way the e-load up! can be back to 80 per cent of its battery capacity in just 30 minutes. 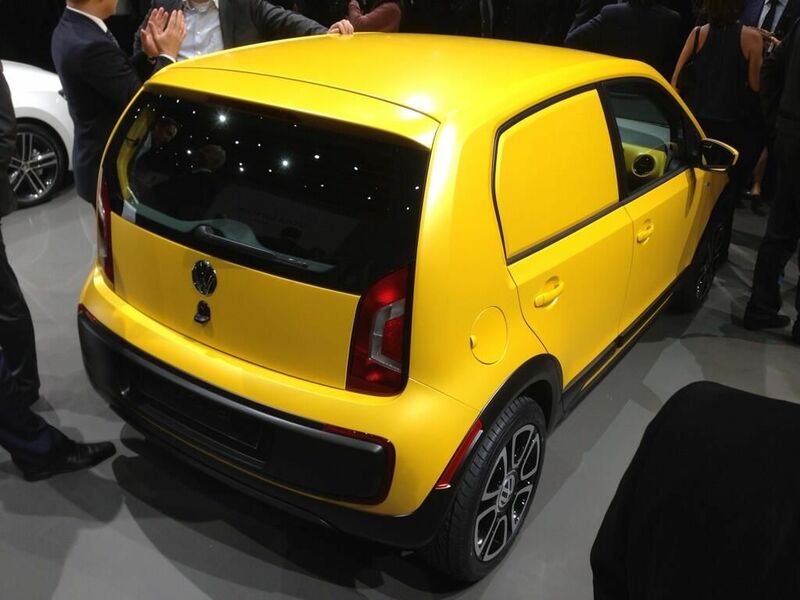 However, the power train concept of the smallest van in the Volkswagen fold goes one step further. 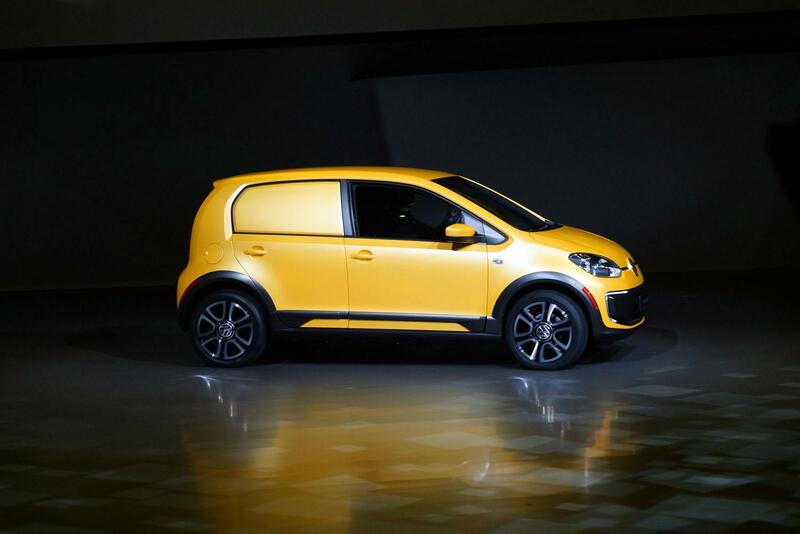 If the customer wants a different form of drive system, that’s no problem either: the Volkswagen load up! can naturally be ordered with any of the passenger car version’s standard power units: from the economical petrol engine to the excellent natural gas one. Thanks to its low fuel consumption, its low CO2 and noise emissions and the type and amount of pollutants emitted, the latter, as the eco up!, has just been named the most environmentally friendly car of the year by the Motoring Club of Germany (VCD). Thus making stepping on the gas even more fun! Facts at a glance • Name: e-load up! • Character: Urban, electrically powered very small delivery van • World premiere: September 2013, IAA Frankfurt • L/W/H in mm: 3540/1645/1477; • Engines / performance: Electric motor 60 kW / 82 PS max. Maximum torque 210 Nm. 0 to 100 km/h: 12,4 seconds. Top speed: 130 km/h. • Battery: Lithium-ion battery, capacity 18.7 kWh. Range: up to 160 kilometres (NEFC).